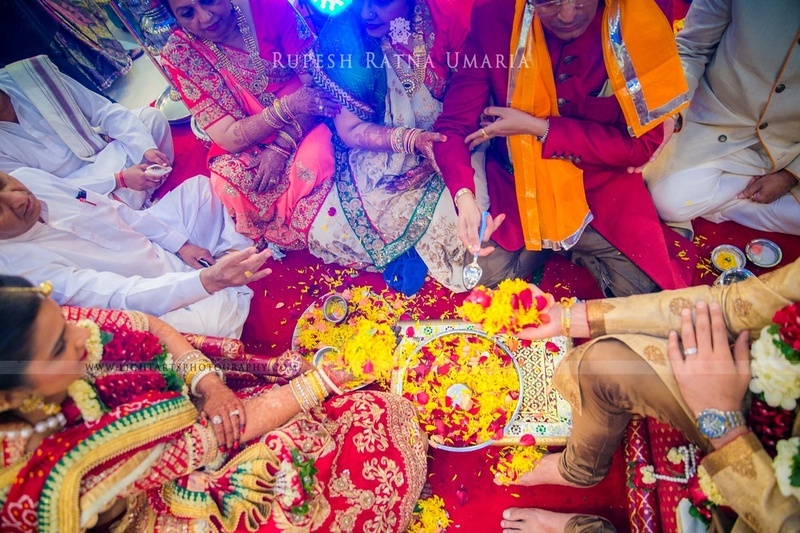 A wedding ceremony filled with tons of rituals, colour and décor that will truly inspire! 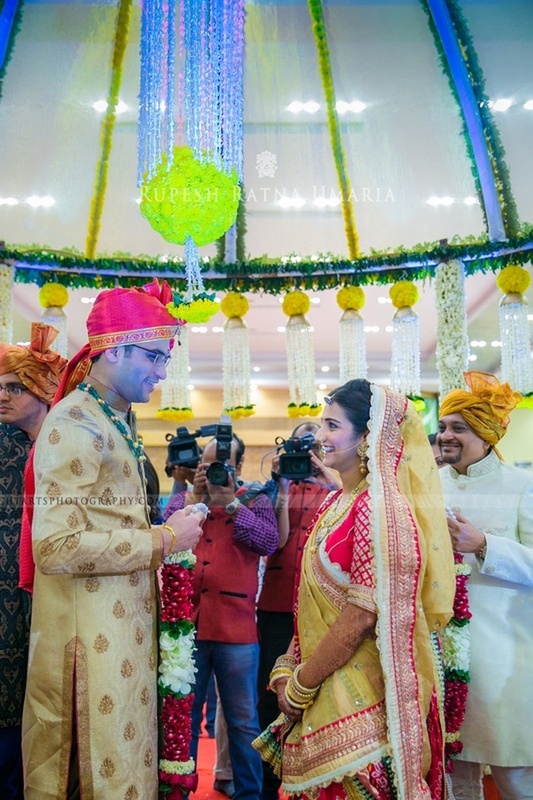 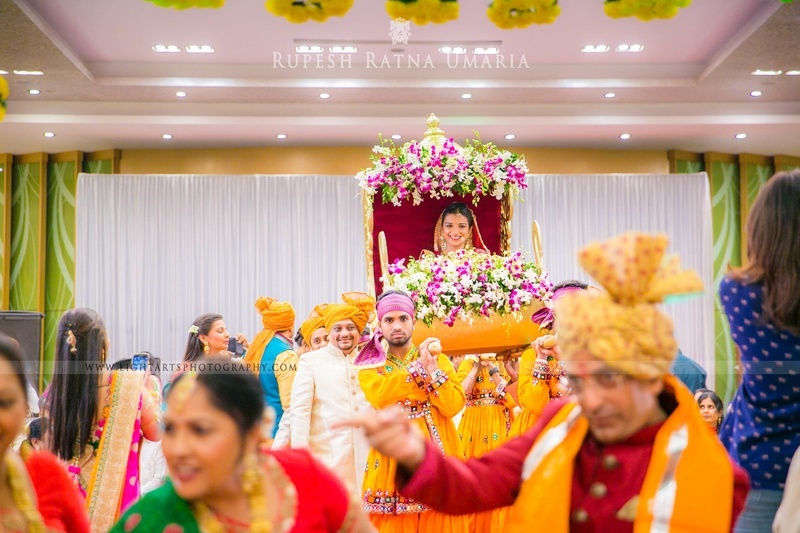 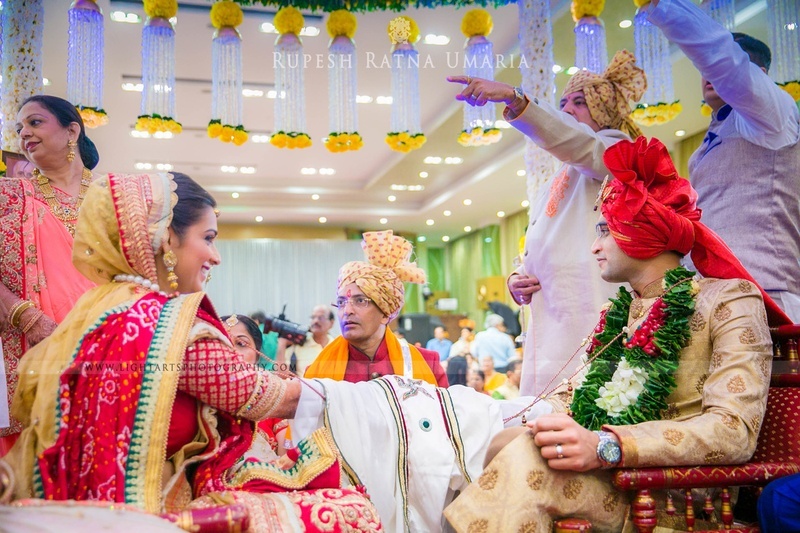 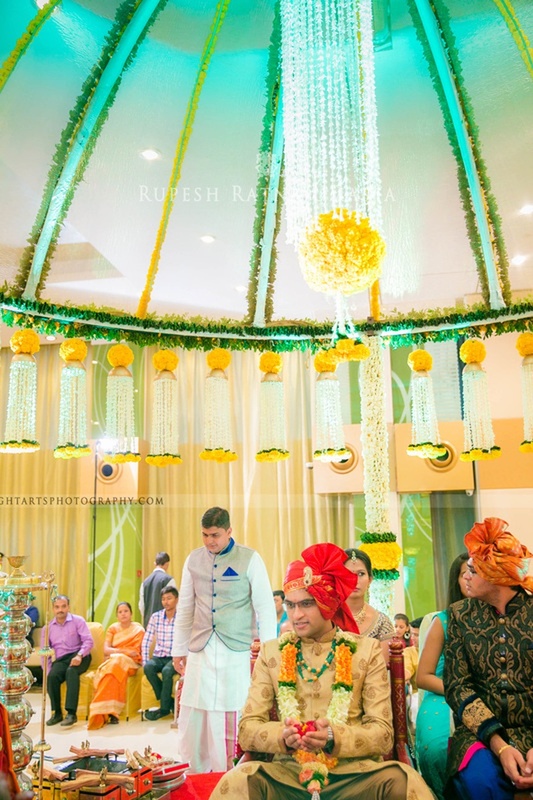 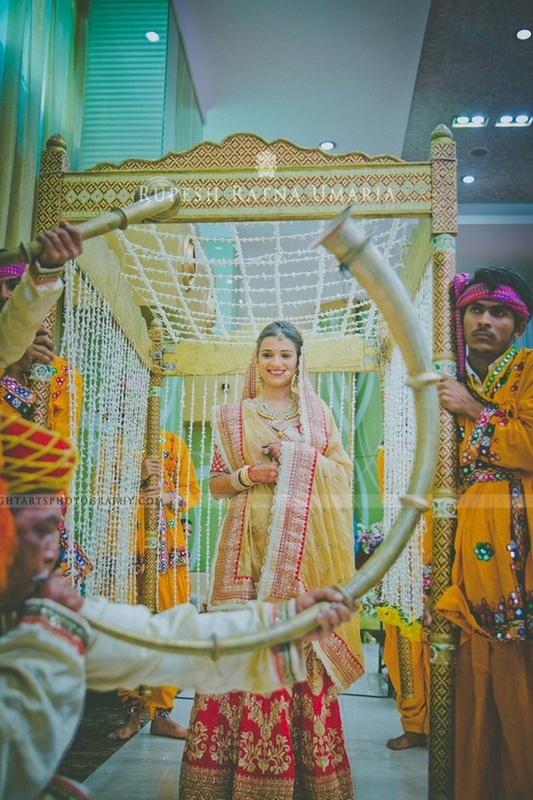 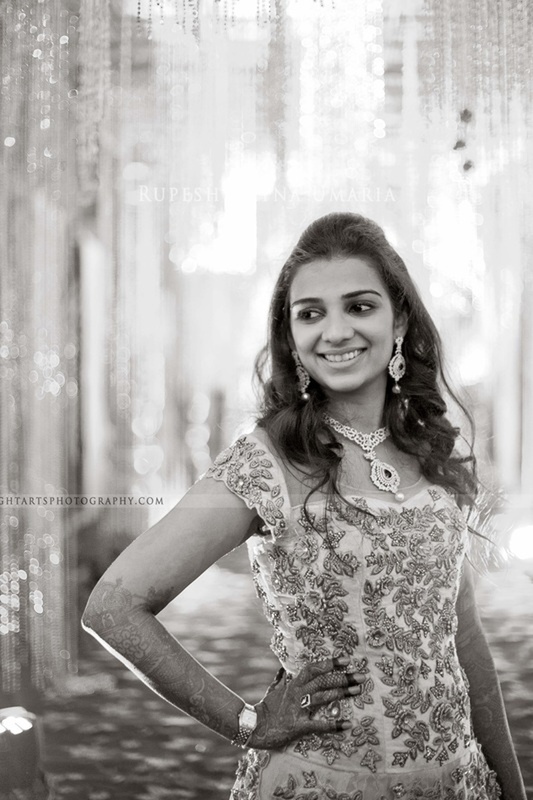 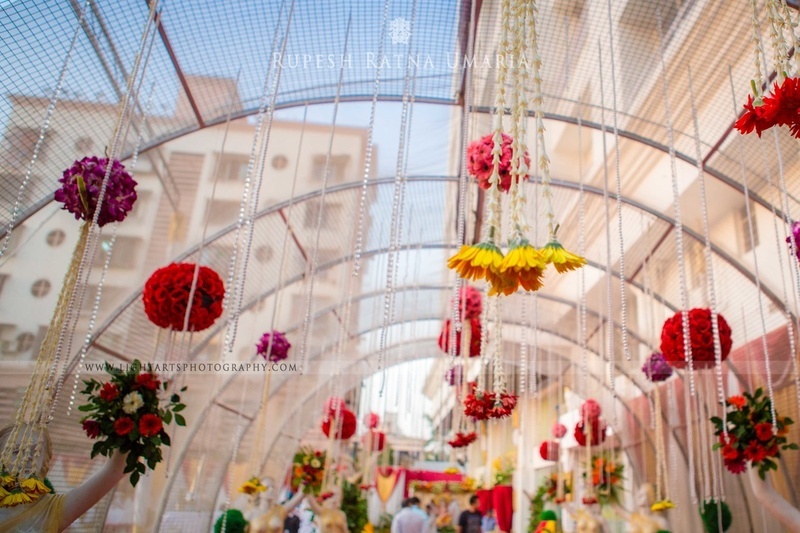 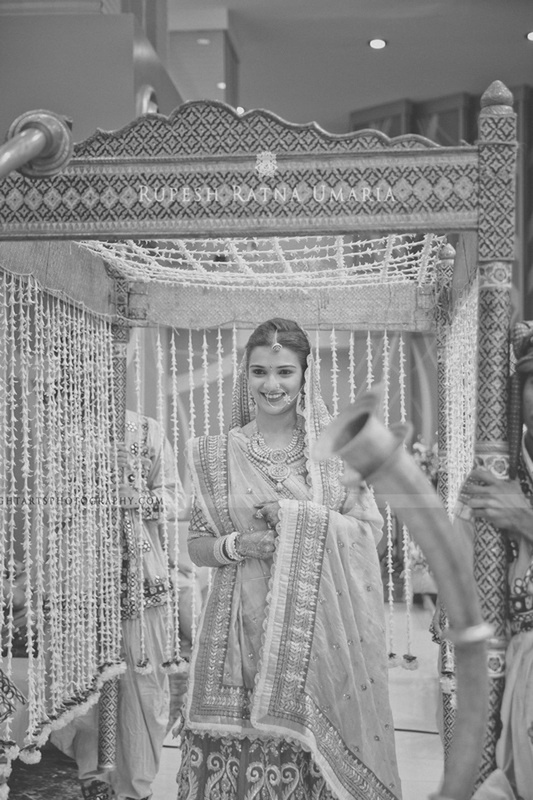 Pooja and Neeraj’s marriage was one that truly set the standards high for grand weddings! 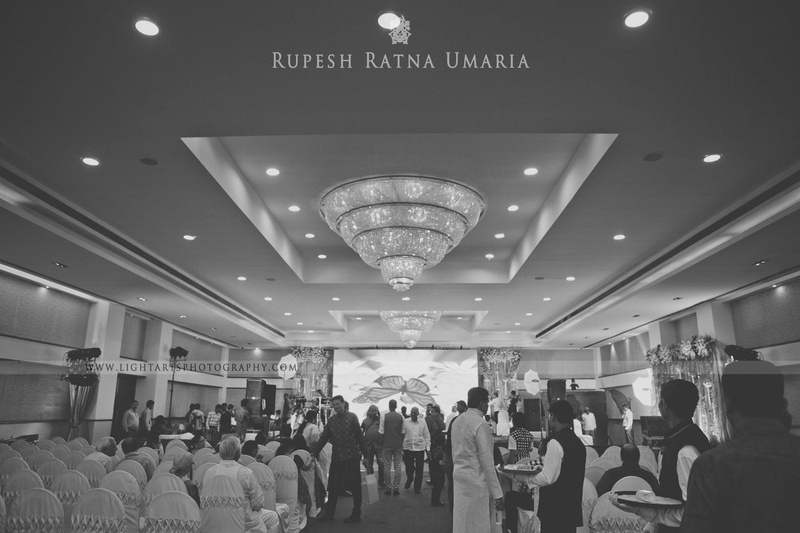 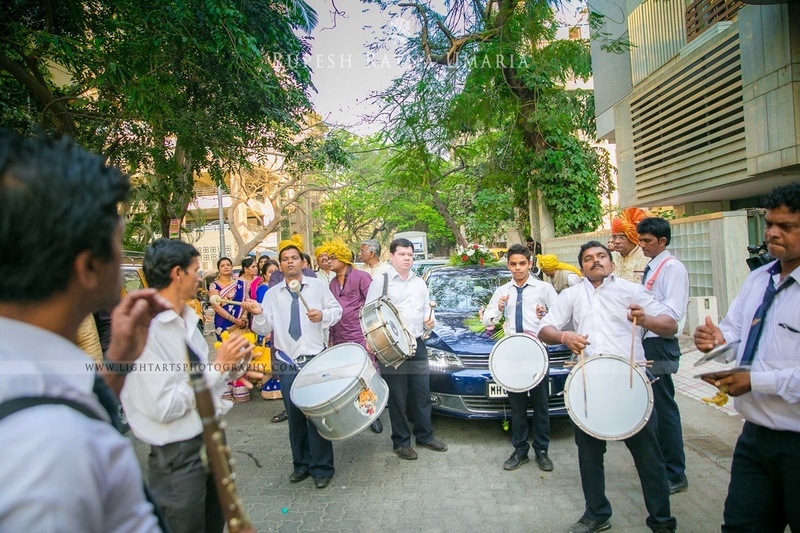 Celebrations began with the Sangeet ceremony held in a brightly-lit banquet hall. 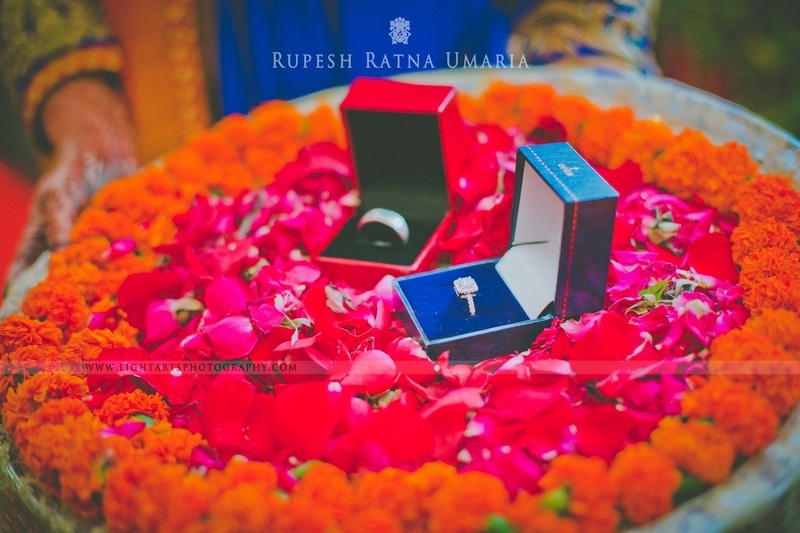 This couple opted to do things a little bit differently. 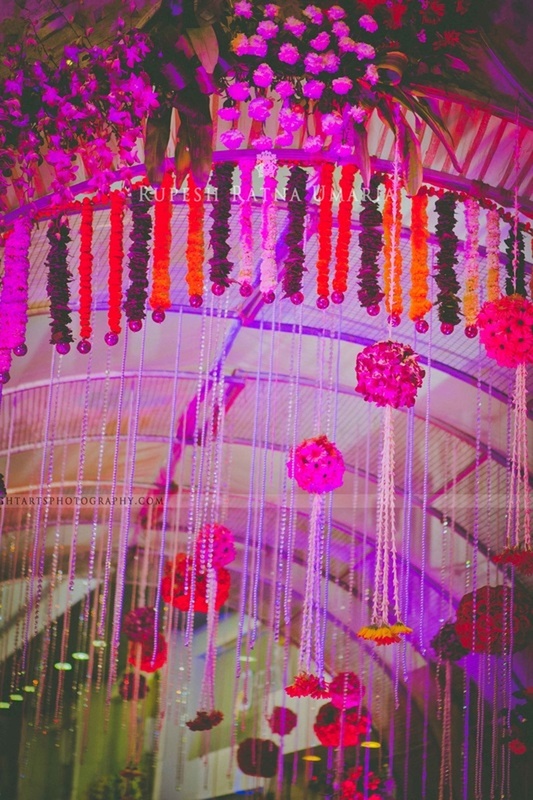 Their stage backdrop wasn't flowers, or blue-hued drapes – but rather a bright LED screen – talk about technology taking over the wedding industry too! 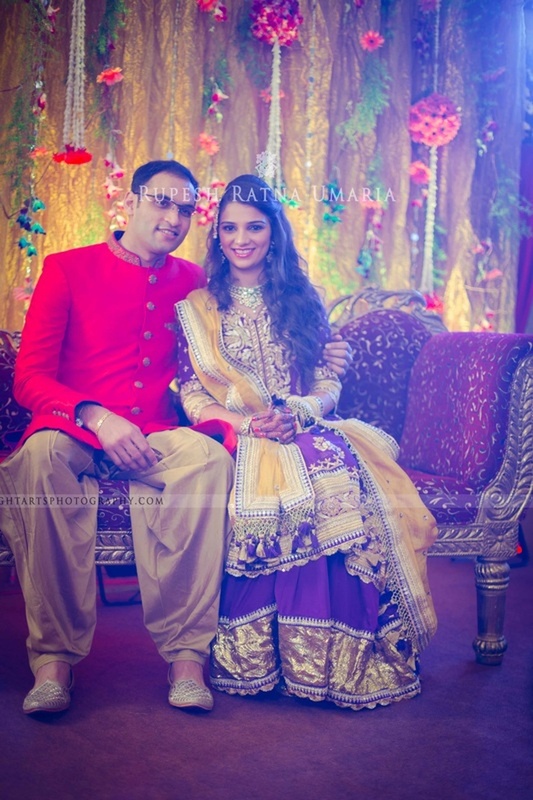 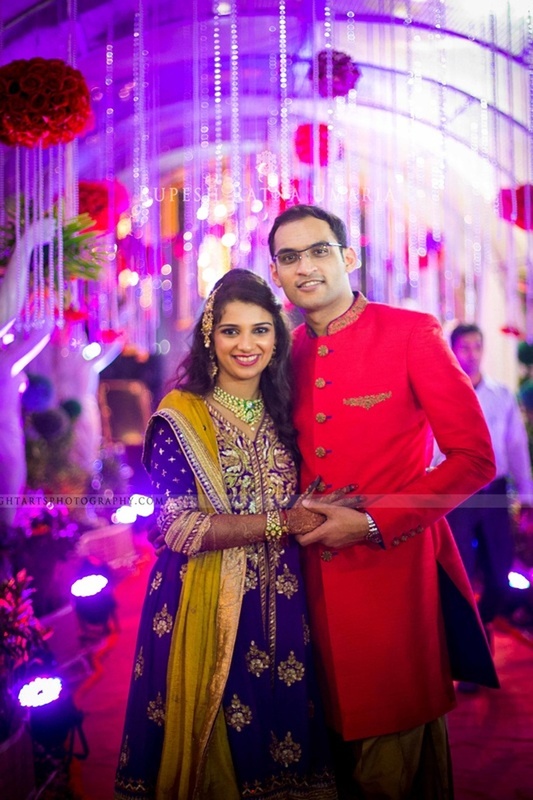 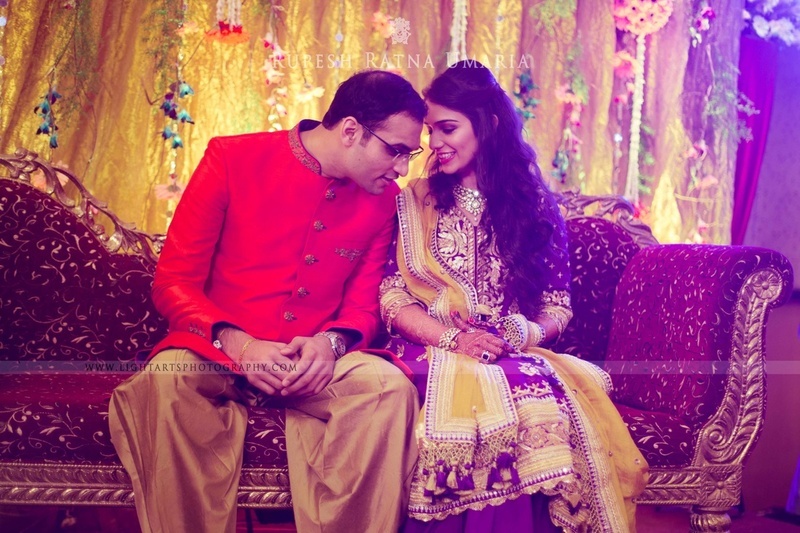 Pooja and Neeraj were dressed ethnically in royal shades of red and purple. 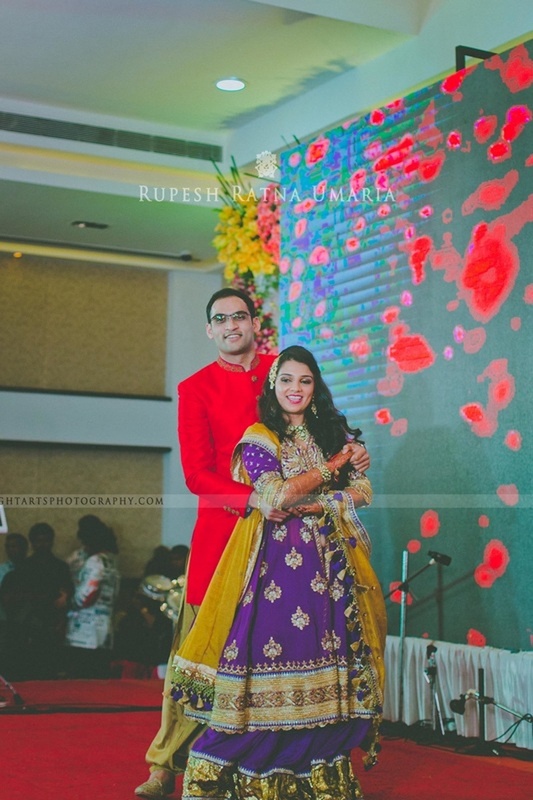 The beautiful soon-to-be bride donned a purple and gold anarkali lehenga, while Neeraj looked sharp in his red sherwani and gold dhoti. 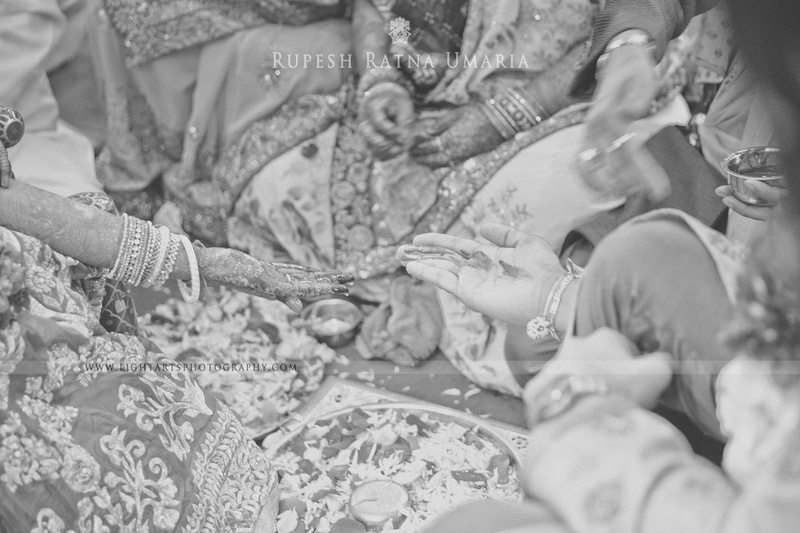 Pooja entered to profess her love to Neeraj forever in traditional style. 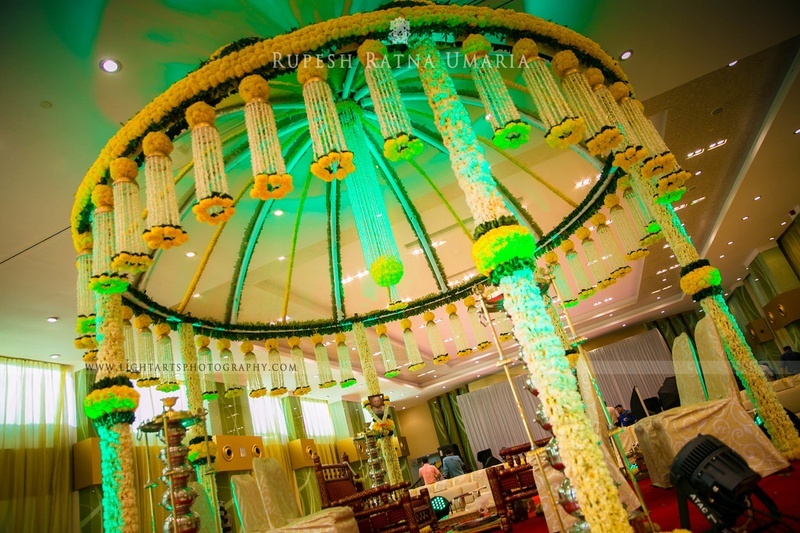 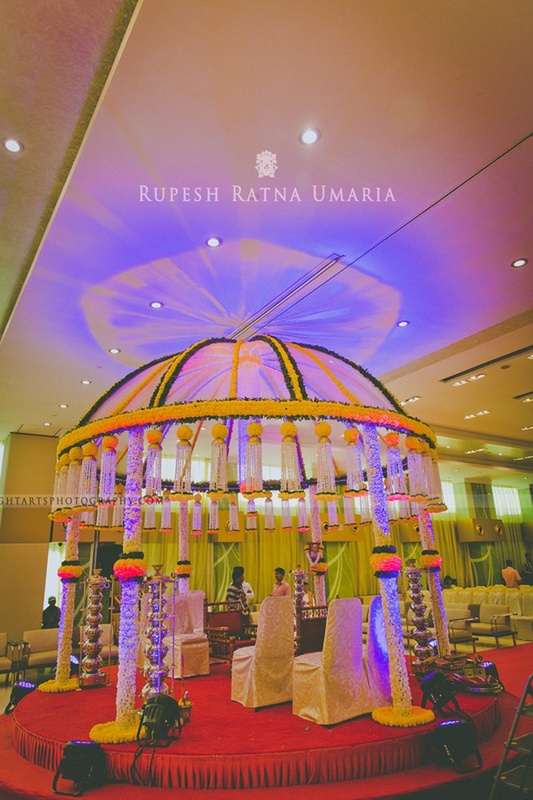 She sat gracefully in a gold-hued doli, festooned with beautiful orchids and fresh green ferns. 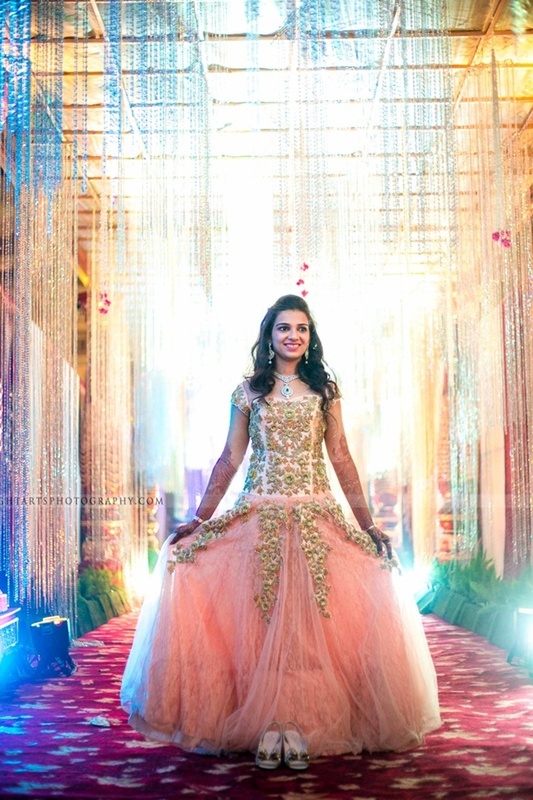 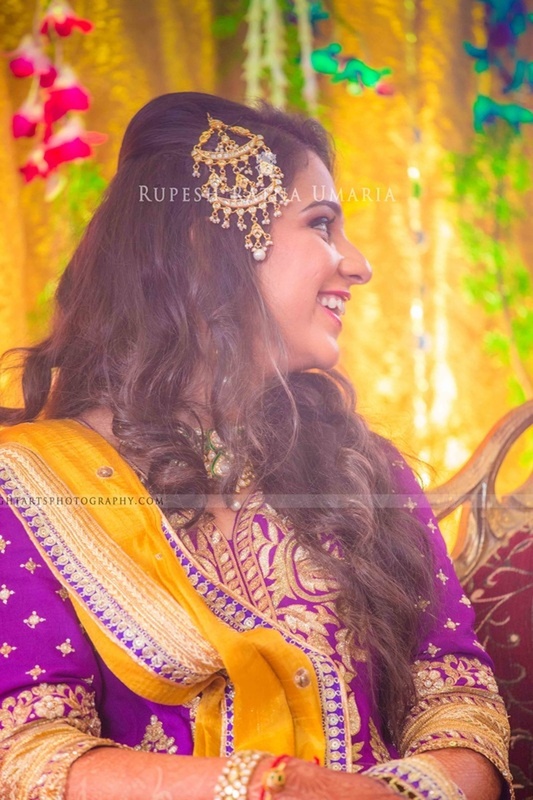 She wore a red and gold kalidar lehenga with gold jewellery that looked absolutely ravishing. 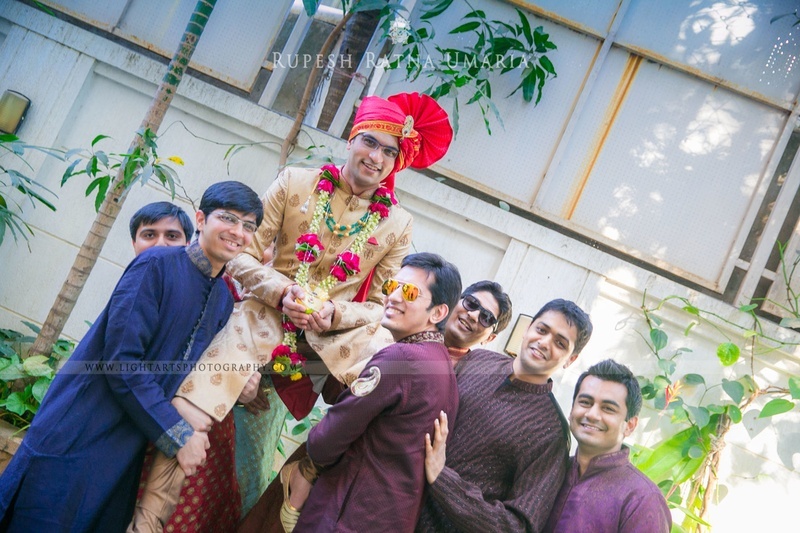 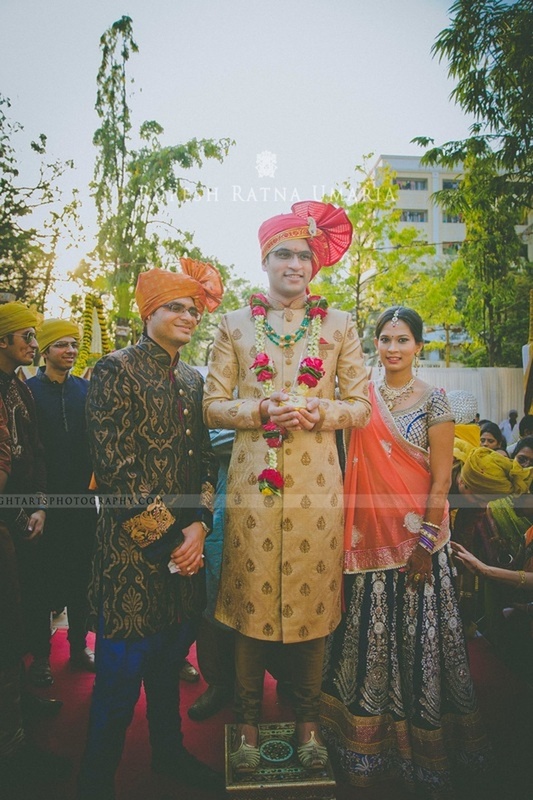 Neeraj followed suit with the royal vibe Pooja had set in his gold-textured sherwani and churidar. 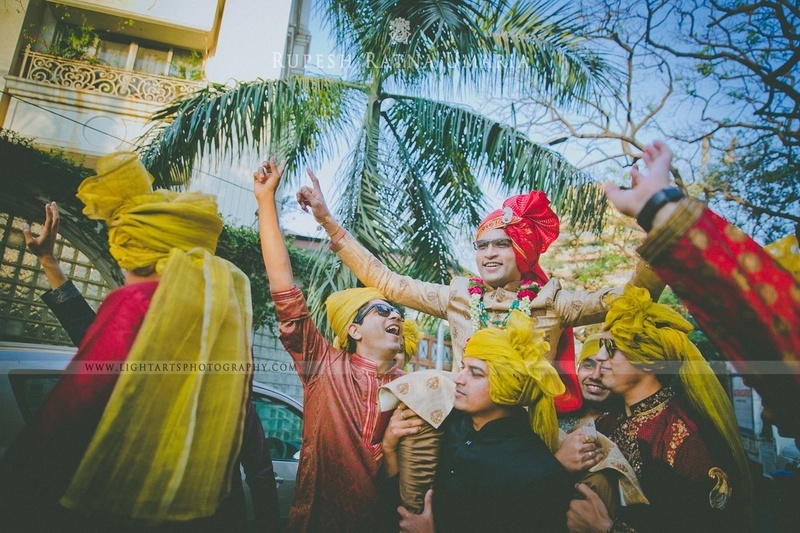 They held hands and took their Saat Pheras under a dome-shaped Vedi mandap decorated with strings of fresh flowers in hues of green and yellow. 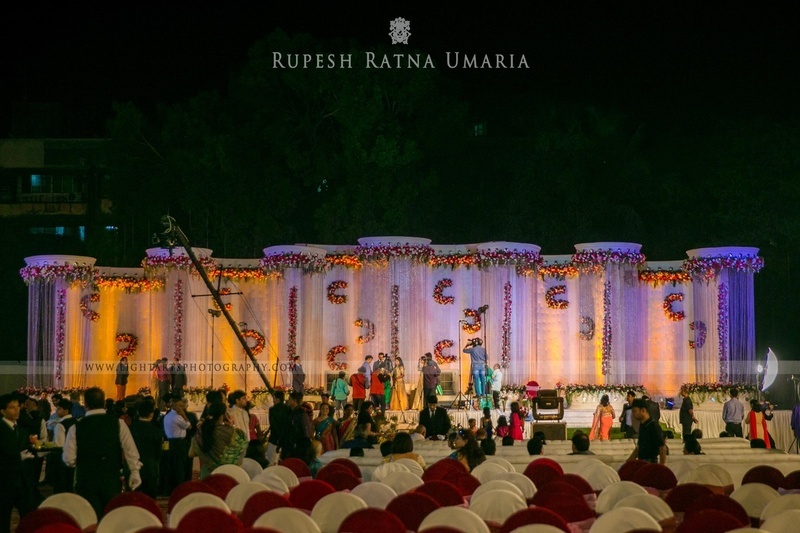 Once things were made official, the grandeur factor went a hundred levels higher at their open air reception ceremony. 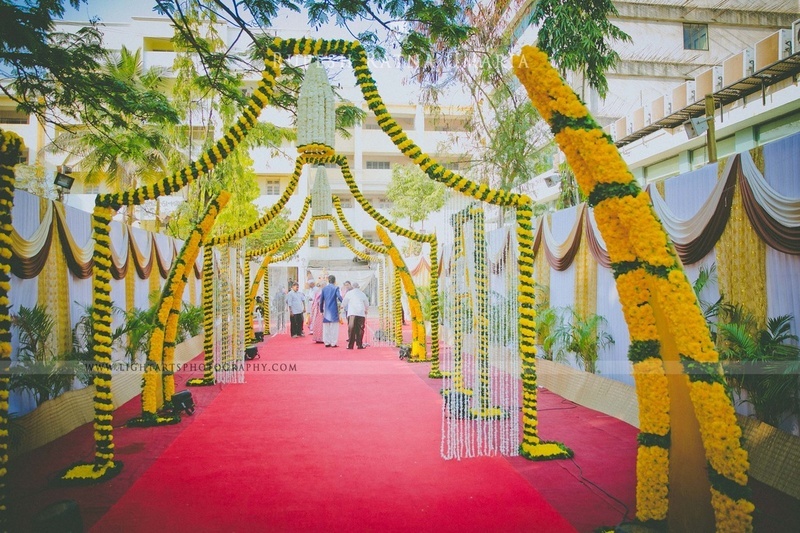 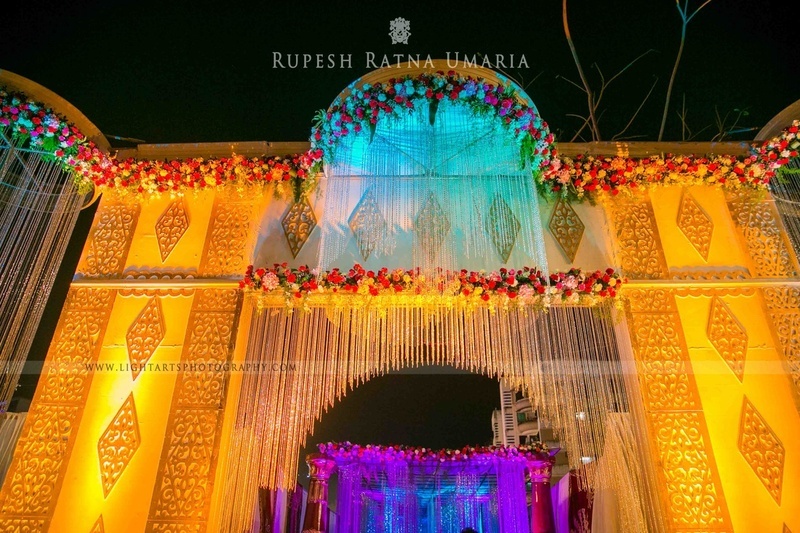 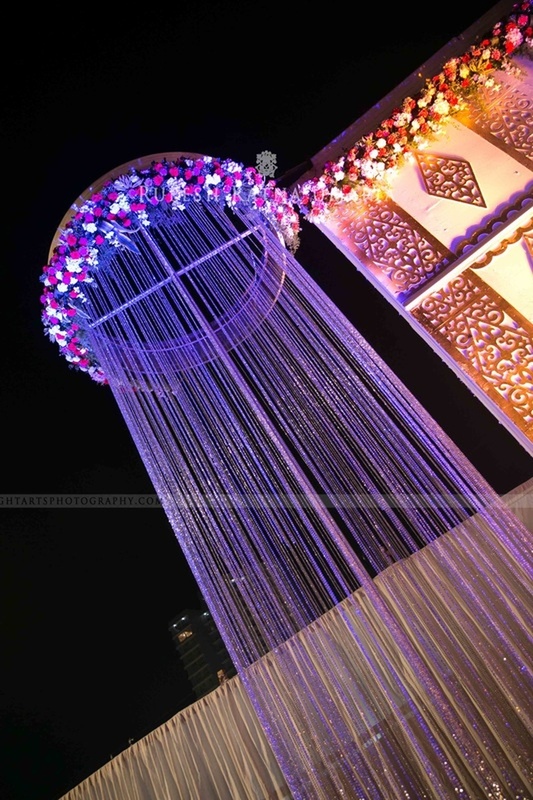 A magnificent stage decorated with crescent moon-shaped floral arrangements strung on pearly white drapes and crystal strings – this décor left us speechless! 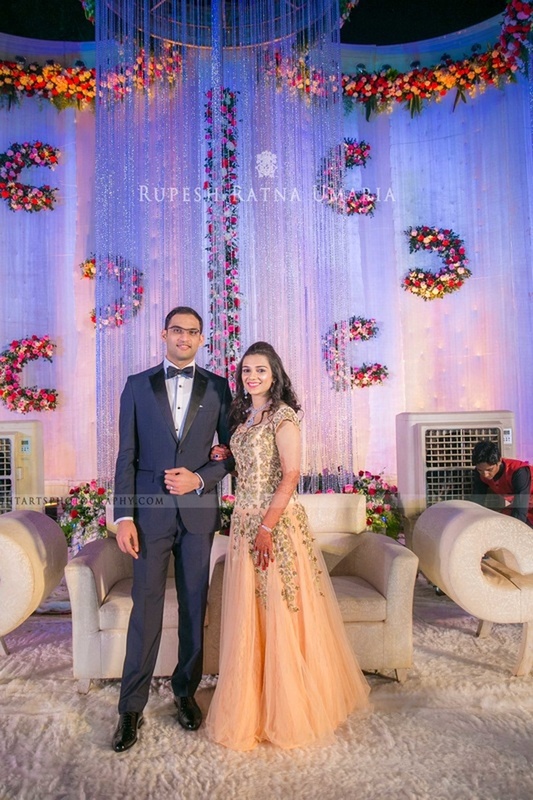 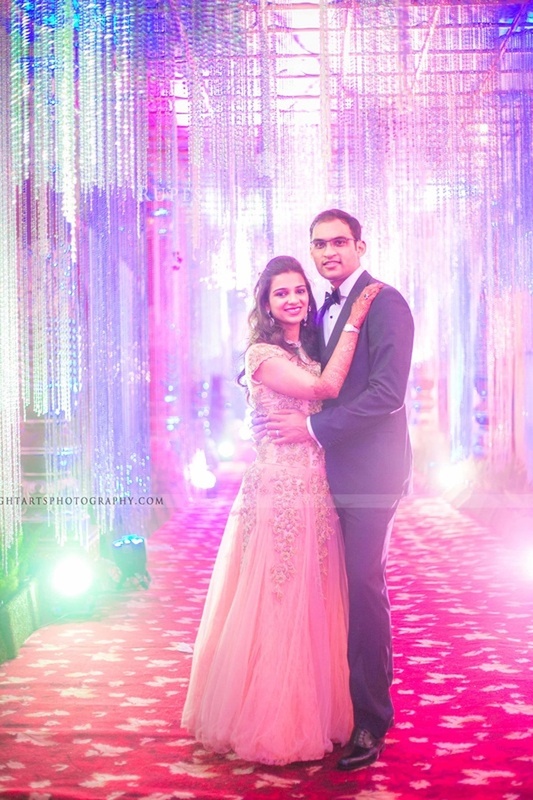 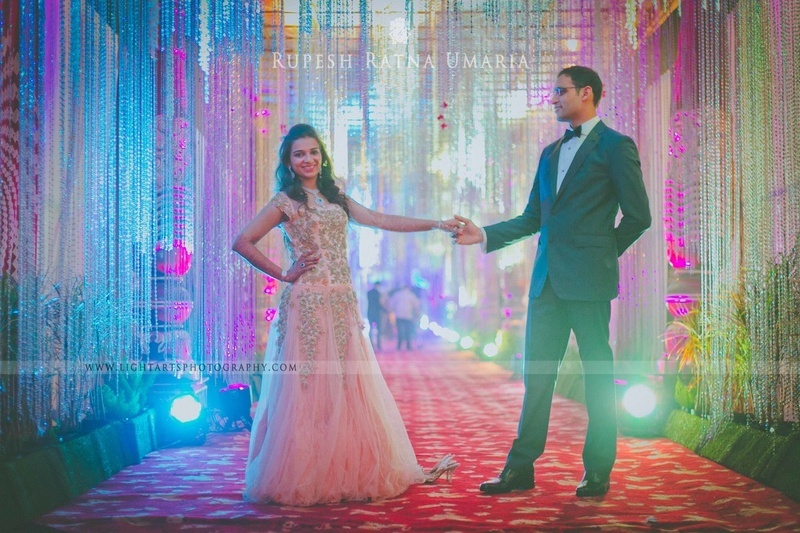 Neeraj and Pooja dressed to complement this grand setup perfectly. 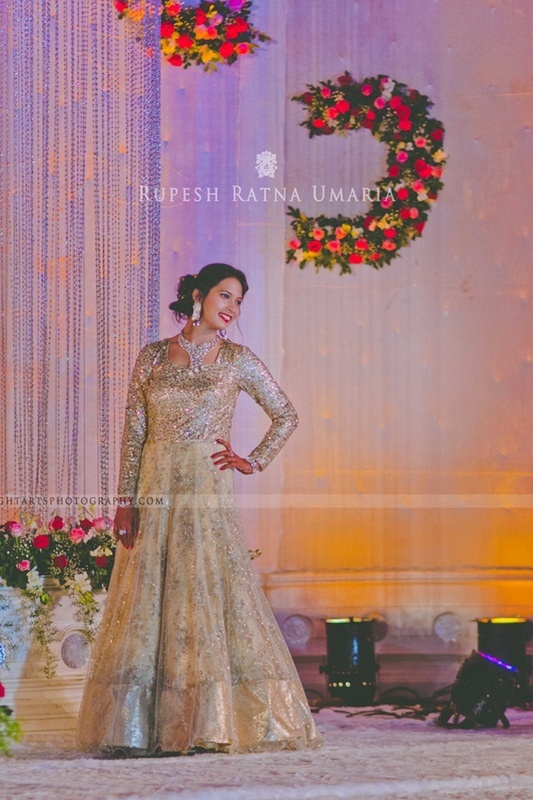 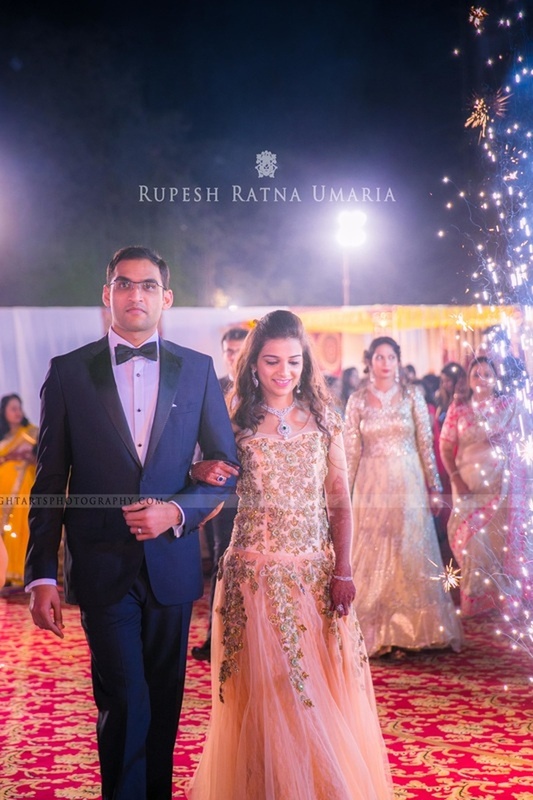 The handsome groom donned a crisp carbon black tuxedo and Pooja wore a stunning gold and beige A-line gown, intricately embroidered and embellished with sequins. 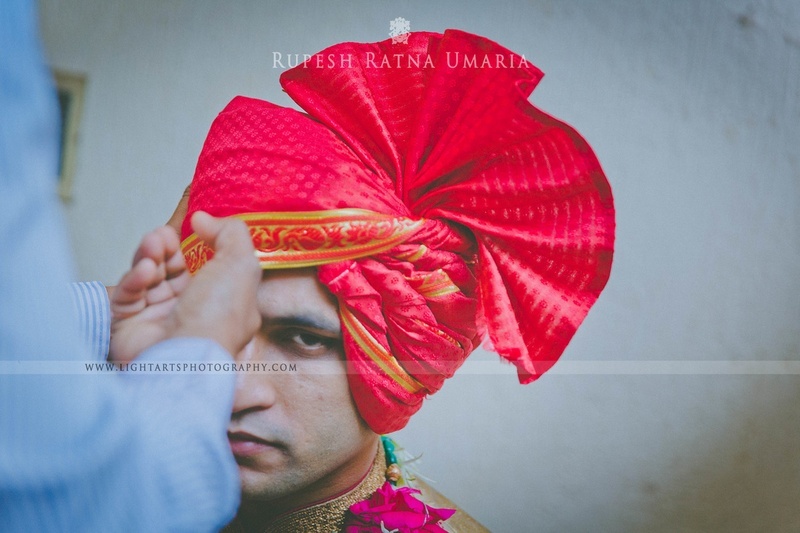 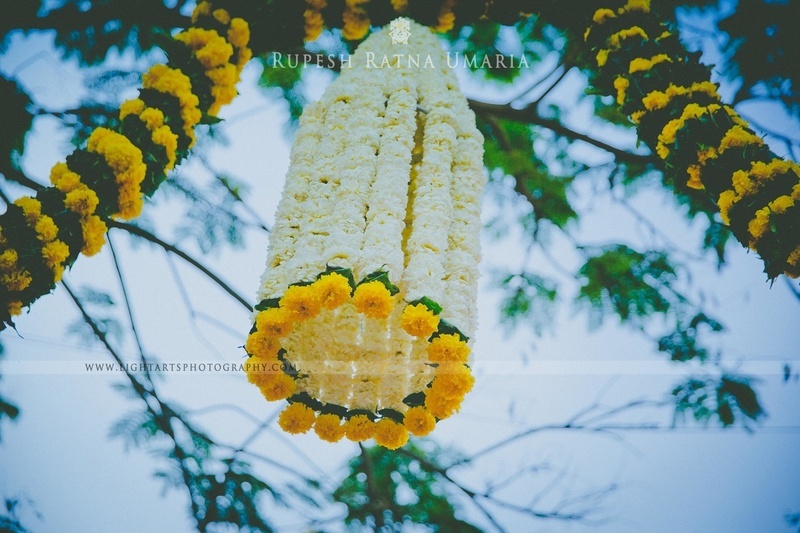 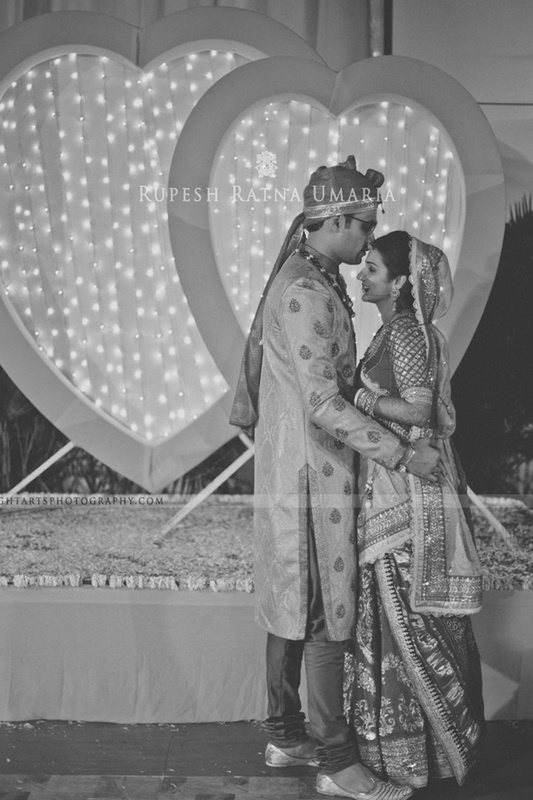 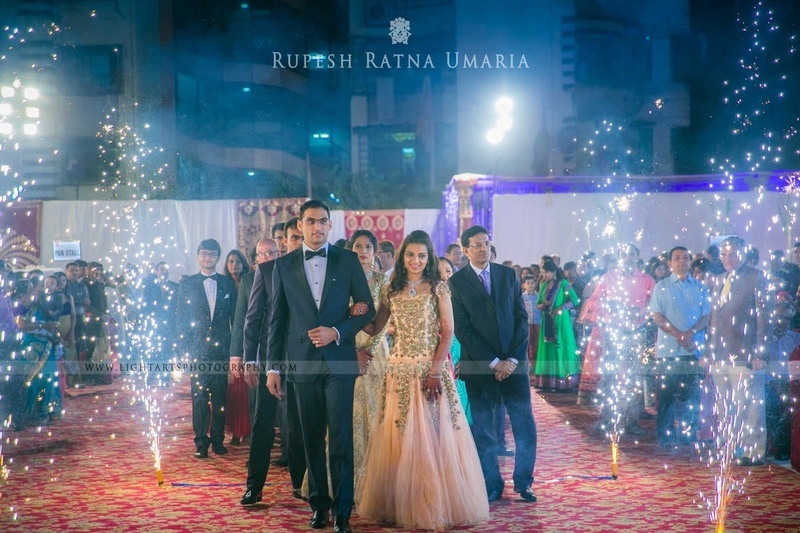 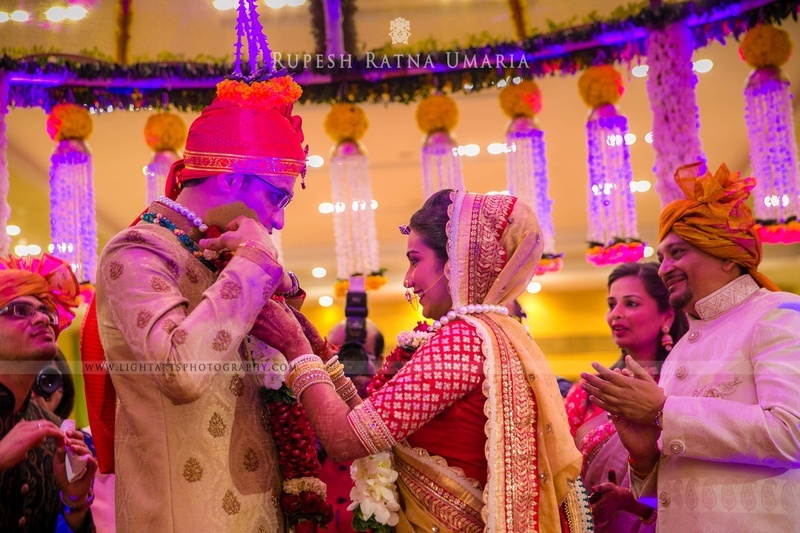 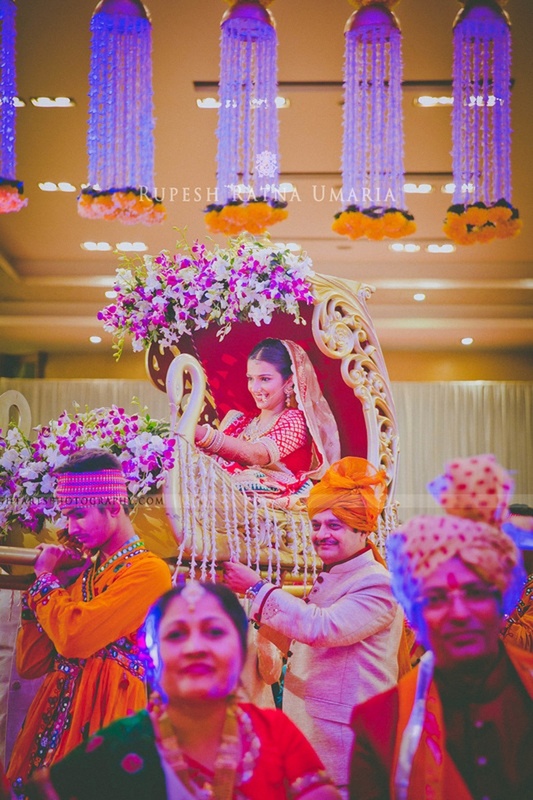 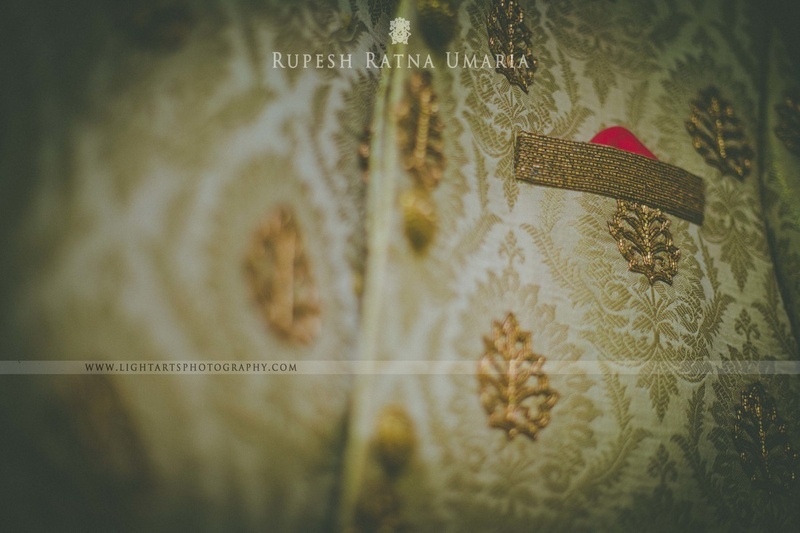 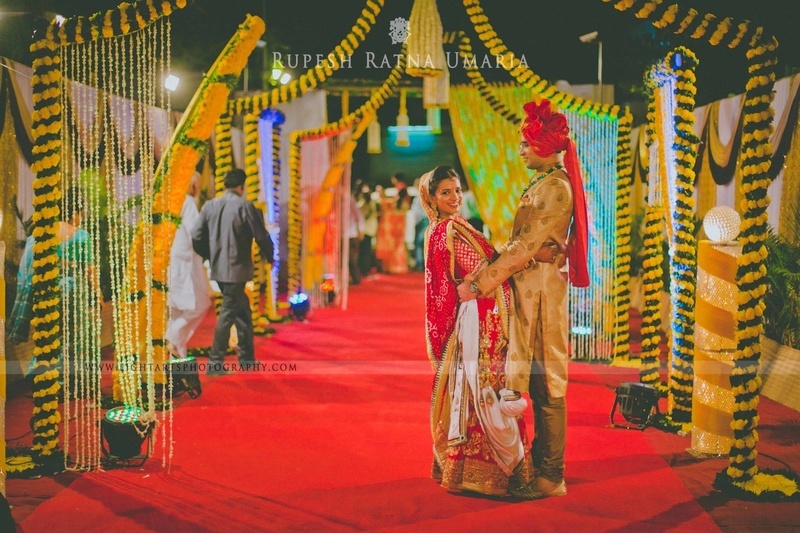 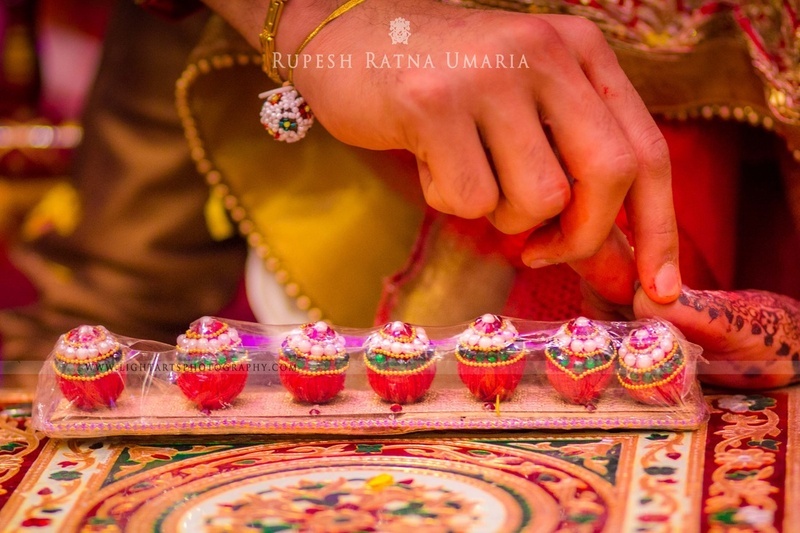 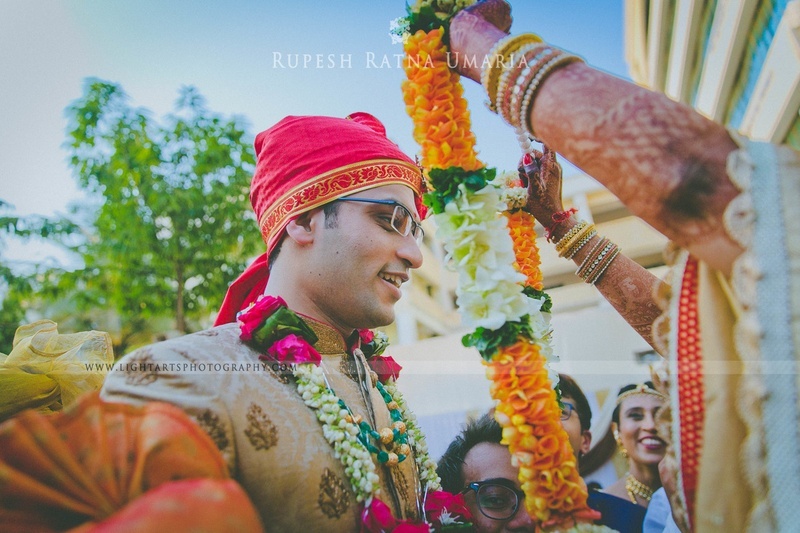 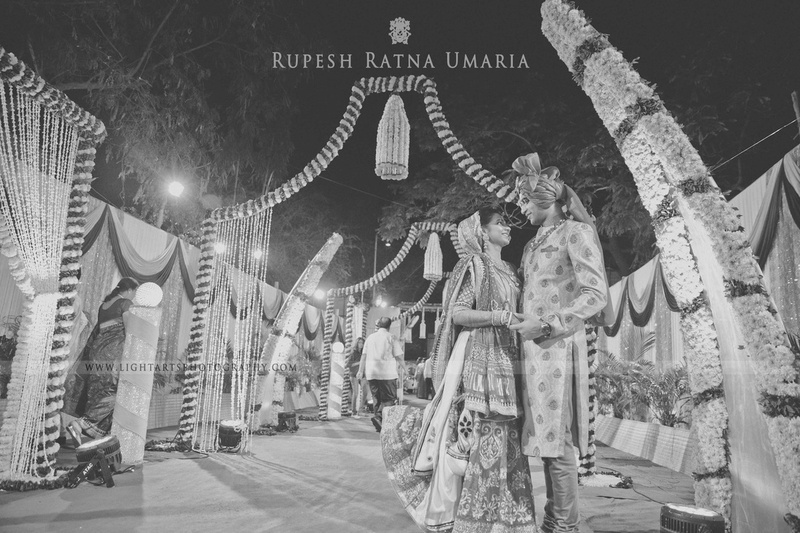 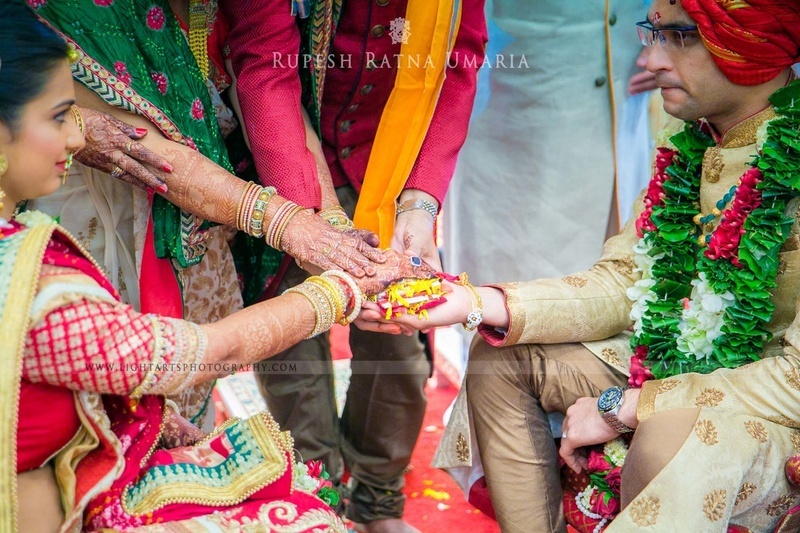 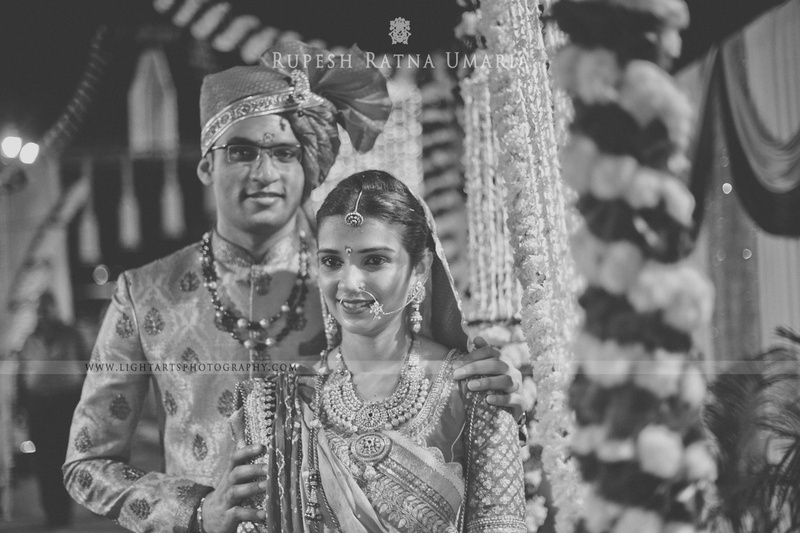 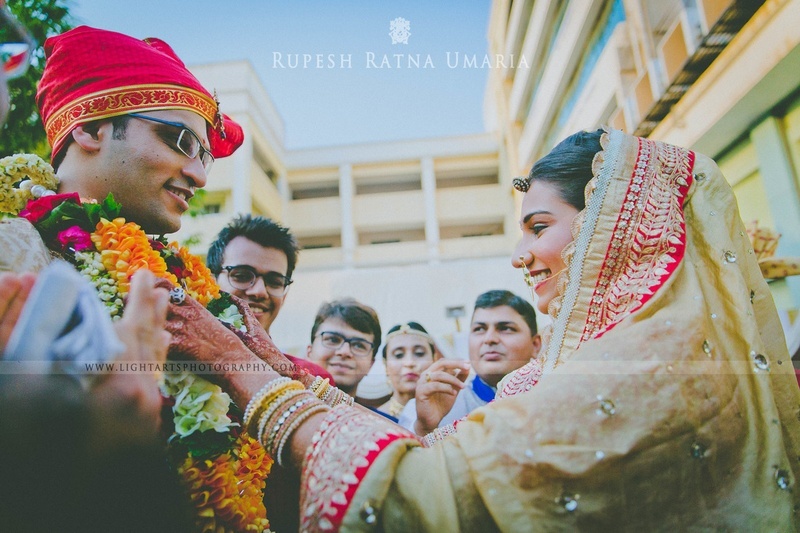 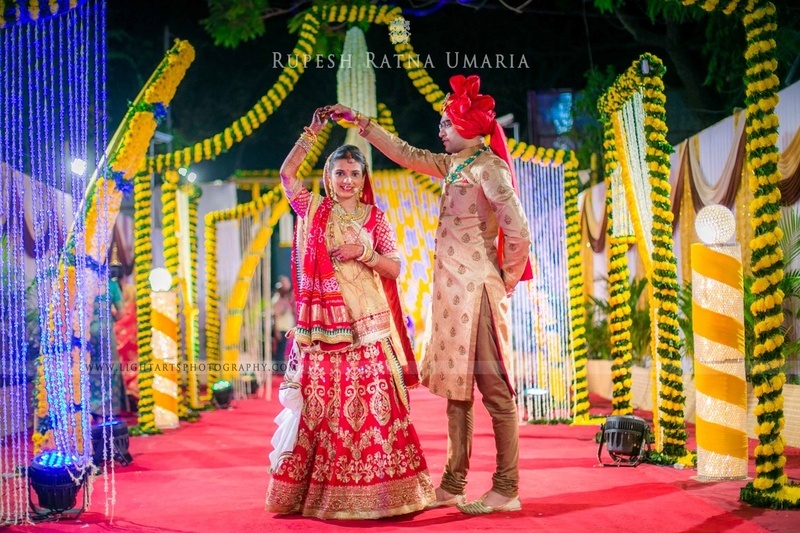 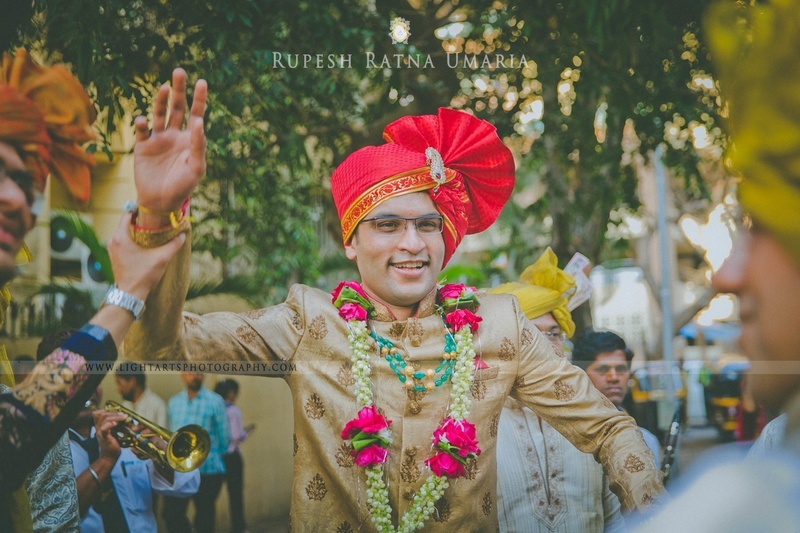 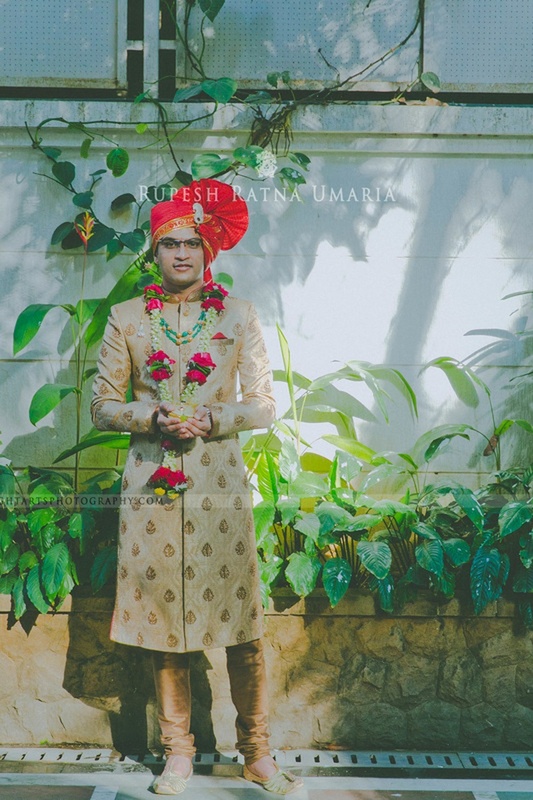 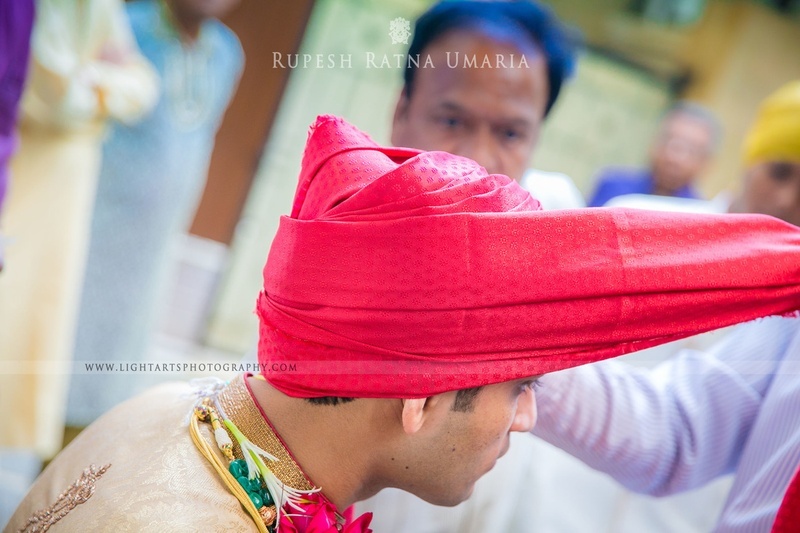 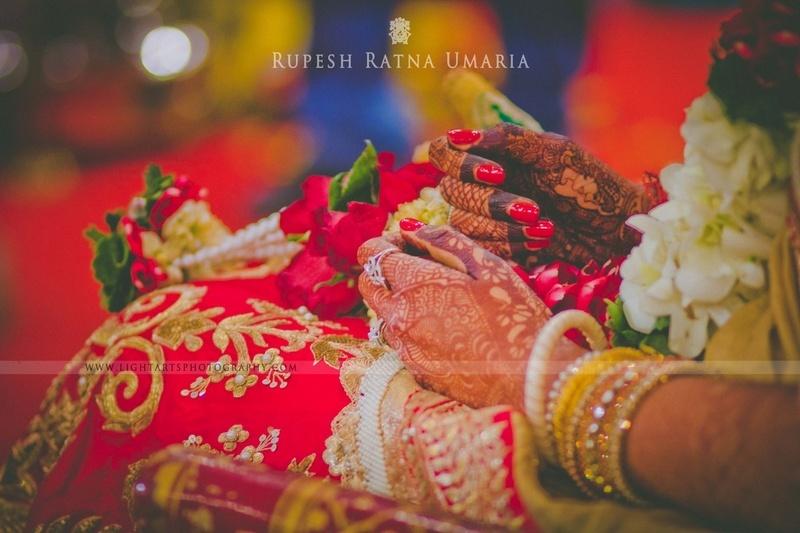 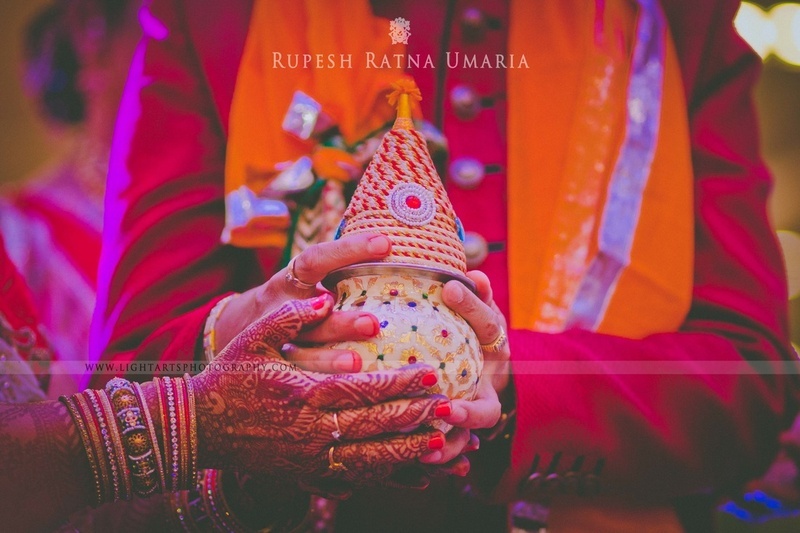 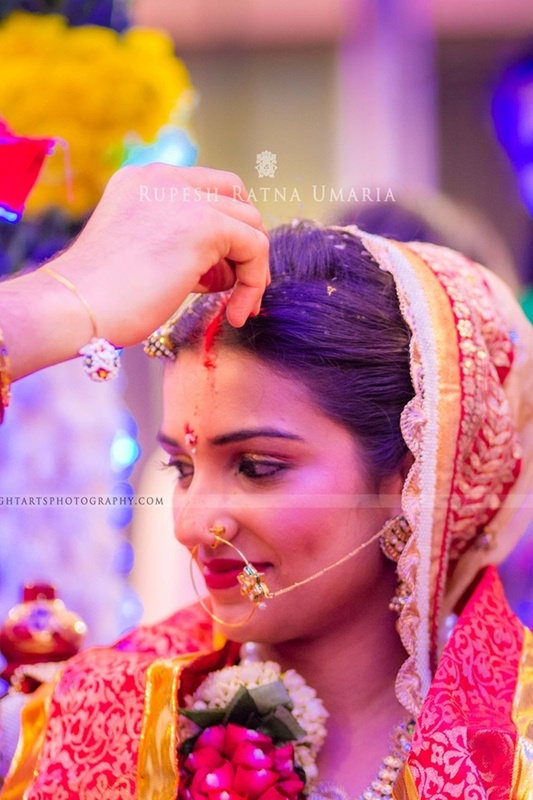 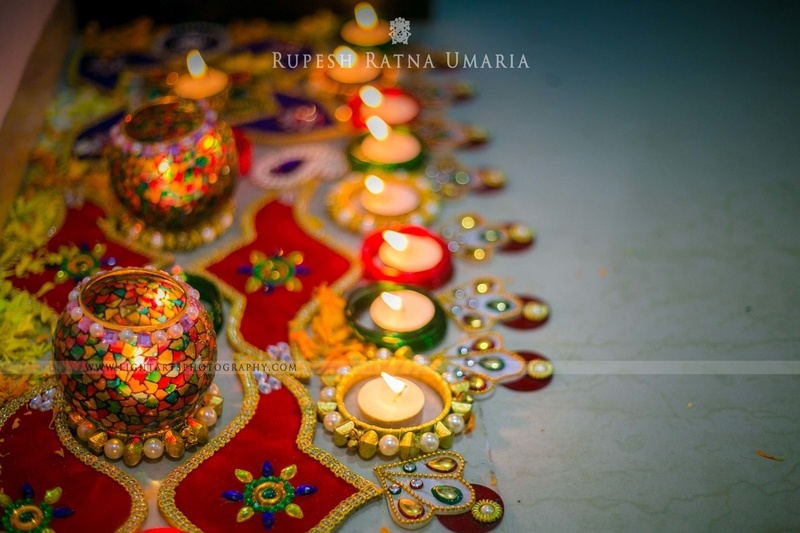 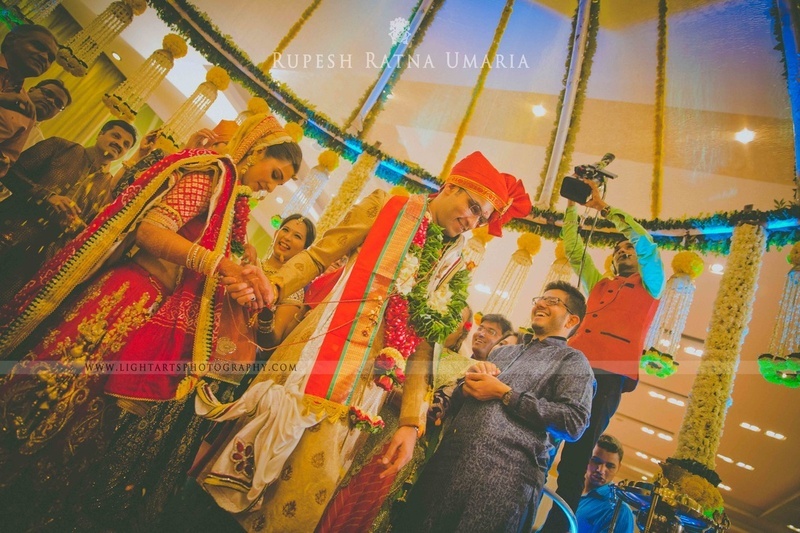 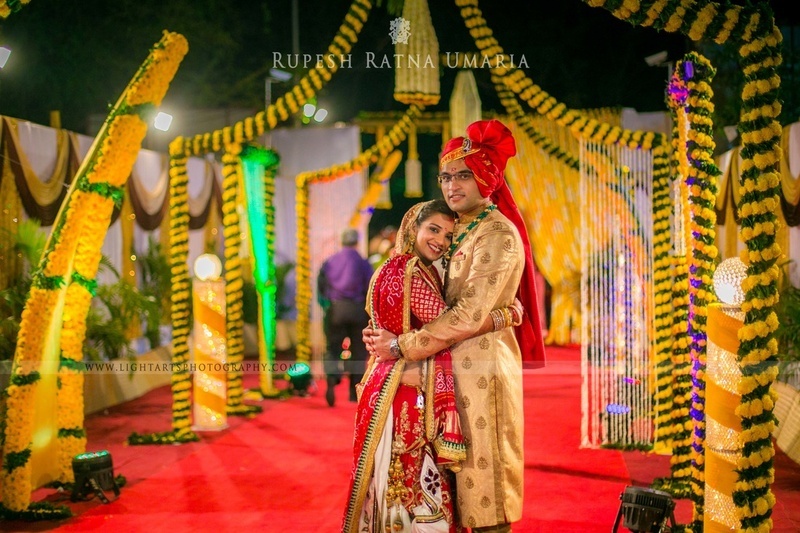 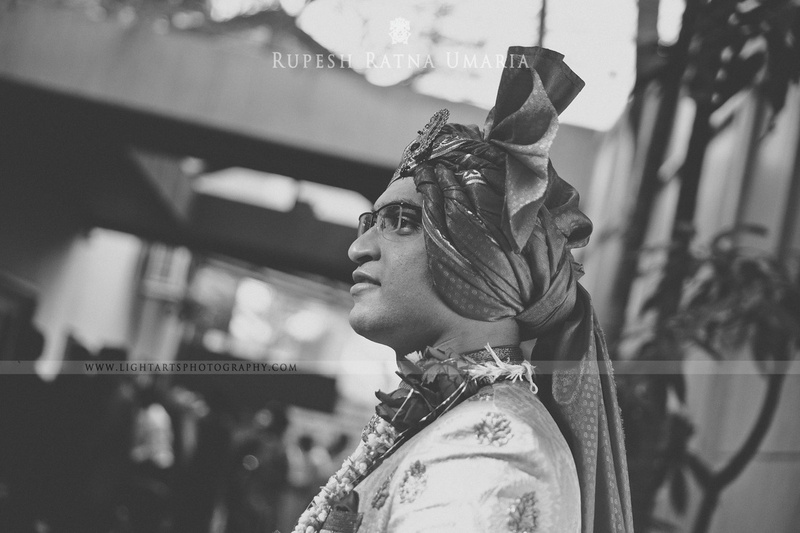 Rupesh Ratna Umaria from Light Arts Photography captured this duo's union with a keen eye for detail, sealing intimate moments that Neeraj and Pooja would like to cherish for eternity.